Software Craftsmanship 2015 is the sixth international software craftsmanship conference, organised by Codemanship. All of the profits from SC2015 will be put towards programming and maths education projects at Bletchley Park and The National Museum of Computing. People who came to previous SC20xx events told us that what they enjoyed best was exploring and getting hands-on with programming challanges, talking to and pair programming with lots of differet people. We want to maximise that experience at SC2015. So, at SC2015, not only will talks still be banned, but we're doing away with the whole idea of sessions and schedules altogether. Want to spend all day trying different programming challenges? Want to spend all day tackling one programming challenge 8 times with 8 different pairing partners? Want to do fun programming stuff in the morning, and then spend the afternoon shooting the breeze with interesting people who care about the things you do? Want to take your laptop dow to the lake and do live blogging all day? Our goal is to make SC2015 as loose as possible. Your day is your own. What we'll provide is a unique venue with an amazing history, a decent Wi-Fi connection, power sockets for your laptops, refreshments, and 100 of the most passionate and open-minded software developers for you to bounce ideas off, learn from and socialise with. We'll be asking people to submit their ideas for programming challenges and mini-projects which will hopefully fire the creative juices on the day, and you'll be able to pick these up and try any that take your fancy. These could be things like "Build your own code metrics tool", or "Write a program that plays another program at poker and start a poker tournament at SC2015" or "Write a program that reverses time and visit the dinosaurs", or whatever flight of fancy our contributors dare to take. As long as it has an element of craftsmanship to it, and exercises the code craft muscles, we're interested in hearing about it. use the organiser's email address at the bottom to get in touch if you have an idea(s). A proper grown-up RFP will go out soon. Their creators will be around on the day to answer questions and give tips and advice based on their own experiences tackling the project. Some might take about an hour. Some might take you all day. Estimated completion times will be clearly signposted to help you plan your day. If none of them take your fancy, do your own thing. Or take a wander around beautiful and historic Bletchley Park, including the amazing National Museum of Computing, and see if the muse grabs you. This year, we'll also be promoting the theme of Developer Culture, Ethics & Diversity in the informal discussions going on throughout the day. We'll be asking a group of volunteers to prepare "Conversation Cards" - yes, just like in Monty Python & The Meaning of Life - with interesting statistics, thought-provoking facts and (hopefully) conversation-inspiring questions to inspire discussion, brainstorming and debate. And, yes, if you just want to spend the entire day discussing issues with your peers, at SC2015 you can. Doors will open at 9am, where you can register and pick up your information pack, grab a tea of a coffee, and then relax for a bit, or jump straight in. It's entirely up to you. If you decide to stay with us for the evening, there will be sausages! Oh yes! (And veggie sausages, too.) And booze, soft drinks and entertaining diversions. None of which are compulsory, of course. If you want to sit outside and gaze at the stars instead, at SC2015 you can. Software Craftsmanship 2015. Yes, You Heard Right. After much discussion and beer and brainstorming and beer and then more beer, I've decided that there will be a Software Craftsmanship 2015. Firstly, not only will there be no presentations (as usual), there will be no sessions at all. How is this possible? Well, the fun in SC20xx was always in the doing, so SC2015 will be 100% doing. Instead of proposing sessions, I'll be asking people to devise problems, games, challenges, projects - fun stuff that folk can pick up and pair with other folk on for as much of the day as they want. We'll provide the space, the Wi-Fi and the sausages (yes, there will be sausages). You provide the laptop and your brains and enthusiasm. Each mini-project will have a point to it. This won't be just some random hackathon. They'll be devised to exercise some of your code crafting muscles, hoppefully in entertaining and interesting ways. There'll be a handout that explains it, links to useful resources, and the person/people who devised the challenge will be nearby and easily identifiable, ready to answer questions and give feedback. They will,, of course have completed the challenge themselves beforehand. SC20xx has never been home to people who only talk the talk. So, with a good wind behind us, you will learn something. But in your own time and at your own pace. How you structure your day will be entirely up to you. We'll open the doors, say "howdy" to y'all and then point you to the rooms/spaces where different kinds of challenges can be found, and off you go. There'll be scheduled coffee breaks and lunch and wotnot, naturally, but your day is your own. Want to gra a challenge and then go sit outside with a chum and do it on the lawn? Dandy. In the evening, as is the tradition for SC20xx, there'll be diversions, and sausages. Or sausages and diversions, depending on your priotities. Or diverting sausages, if that's your sort of thing. Of course, there will be discussions. As well as the usual technical stuff we like to natter about, I'm going to provide "Conversation Cards" - yes, exactly like in Monty Python's The Meaning Of Life - on the theme of Developer Culture, Ethics & Diversity. If you want to find a space and have a debate, feel free. If you want to write a blog post based on one of the cards, fill yoour boots. If you just want to chat about it over coffee, all good. if you don't want to talk about it at all, no pressure. Nothing's compulsory. Blog posts, GitHub wotsits, photos, videos and all manner of outputs from the day will be aggregated, collated, assigned to pastel-coloured categories and then fed to the huddled masses who are starving for a bit of quality. It's likely to happen in the Spring, when the weather's warming up (I'd put my money on May). We'll be fieelding proposals for challenges within the next few weeks, and all materials will need to be finalised a month before the event. I shan't call it a "conference", because that's the one thing it's not going to be. So, there you have it: Software Craftsmanship 2015 (#sc2015), May-ish 2015, very probably at Bletchley Park, very probably all profits from ticket sales will fund programming clubs or something along those lines. Are you tired of hearing from the same old faces at dev conferences (including mine)? #DevConDebut is a brand new conference designed to promote new talent. Every speaker will be someone who has never spoken at a conference before. We're aiming to take a few risks to bring fresh ideas and new voices into the developer community. But we need your support to do this. Conference organisers like to use experience speakers; they're a safer bet and they can make events easier to promote. All the proceeds from ticket sales will help fund educational programmes in maths and computer programming at Bletchley Park and The National Museum of Computing. It's all in a very good cause. I know folk are busy, and you've probably got 1,001 other things to worry about; but your support will be vitally important to get this off the ground. If, like me, you want to get behind new talent and hear new voices, please lend us your support. It can't happen without you. This month sees the fifth birthday of my training and coaching company Codemanship. I created the company in 2009 to take advantage of the growing demand I was getting to run workshops and coach teams in what we're currently calling software craftsmanship. I wanted to put into practice ideas that had been swimming around in my silly old head for several years, especially relating to how good development teams happen. I firmly believe, based on my own experiences and on the available evidence, that good software development is a product of good software development cultures, and that culture happens bottom-up over a long period of time. The boss cannot demand good development culture. Management edicts just don't work in this space. Nor can we expect it to happen overnight. You can't send your teams on a 2-3 day course and expect them to come back transformed. Through Codemanship, I focus on developers and their habits and instincts, helping those who want to improve to gradually shift the patterns that are their default behaviour. Our BBC TV Platforms case study illustrates how this can be done and what effect it might have, but there are many ways to skin a rabbit, and many routes to becoming better crafters of software. Over the last 5 years, I've worked with many different organisations and thousands of individual developers, and helped them to discover their own path, just as I once discovered mine. Outside of the day-to-day work, Codemanship has also been busy in the community, and I've been blessed to be involved with some great events and initiatives, like producing a West End comedy show to celebrate the code-breakers of Bletchley Park, organising the original international Software Craftsmanship conference, and curating and contributing to the Music By Programmers album to raise funds for a programming club at The National Museum of Computing. I'm most proud, though, of one extra-curricular activity; my apprenticeship with Will Price, a CS undergraduate who's working with me to help plug the gaps in his education on the practical side of "just how do we write software?" We're reaching the end of our first academic year - though there'll be much for us to do during the summer break - and I'm very pleased with how it's turned out so far. I'll be traveling the length of breadth of the land talking about it, and hopefully encouraging a few of you to try something similar. Finally, just to say a huge thank you to all our customers, without whom none of this would be possible. I'm very lucky to have the chance to work with you all. So, that's 5 years of Codemanship. So far, it's been the most fun, the most challenging and the most rewarding experience of my career, and I've got my fingers crossed that there'll be many more years of this to come. With just four days to go, this would seem like a good time to reveal that this Friday's Software Craftsmanshiop 2013 will be the final SC conference. With more and more events springing up to serve the SC community here in the UK, it's inevitable that we'll be spreading ourselves a bit thinner, making fundraising events like SC20xx less viable. But we've had a good run. A very good run, in fact. We were the world's first SC conference, and over the last 5 years we've raised in excess of £40,000 to support important work being done at Bletchley Park and The National Museum of Computing. I'm also very proud to have maintained the founding principle that sessions must feature live hands-on coding and bags of audience participation. This has brought us some of the most innovative, challenging, and above all fun sessions we've seen at dev conferences for many years. It has also had the added side-benfit of excluding the usual suspects among conference speakers who tend to be - as my mother might put it - "all mouth and no trousers". Although we've consistently struggled to find session leaders (it takes cohones to code in front of a room full of, well, us), the standard of the sessions has been consistently high. Conferences take on a whole different character when session leaders have to show as well as tell. What's really made the difference, though, is the people who've come along. You've rolled up your sleeves, powered up your laptops and had a go. And the buzz at every SC conference has been a joy to experience. In previous years, the conference had sold out before we announced any of the sessions, and above all else, people came to share their passion for a day with likeminded craftsmen and craftswomen. To you, I express my deepest gratitude. If you're joining us for the Last Hoorah on Friday, let's make sure we go out with a bang. I'm delighted to announce that Software Craftsmanship 2013 is now open for registration. This year's conference is being organised by Jon Dickinson of Equal Experts, and will take place at Bletchley Park (where else?) on October 25th. The format's similar to last year, with meatier half-day sessions that participants can get their teeth into. There's also the option to stay on for evening fun and larks (and beer and food, of course) for an extra tenner. If you'd like to run a session - and, as an experience, I highly recommend it - then please submit your ideas here. If you're seeking inspiration, then take a gander at this video overview of the sessions from SC2012. Every penny of the proceeds from ticket sales will go towards educational programmes at Bletchley Park, so it's all in a good cause. This summer sees the 10th anniversary since I launched parlezuml.com. To celebrate that milestone, and to raise more money for programming and maths clubs, I'm running a very special one-off training workshop on Saturday August 17th at Bletchley Park. Tickets are a snip at £99, and all the proceeds will be put towards our goal of starting a programming club and parent-child maths workshops. The album to raise money for maths and programming workshops at Bletchley Park and The National Museum Of Computing has been out for a week now. And what a week it's been! 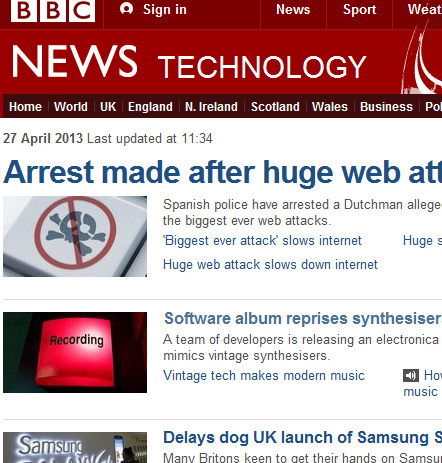 Things kicked off on the previous Friday with an article that ended up being the BBC Tech News number two story, getting a link on the news home page, which generated a lot of interest. 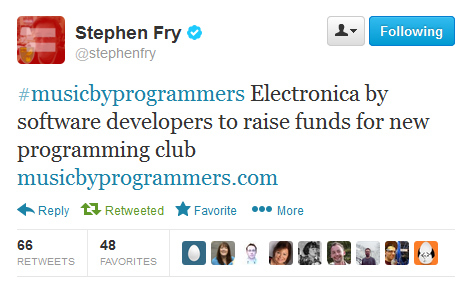 Then on Monday we were assisted by a generous tweet from Stephen Fry. Together with bags of other social media activity, and coverage by PC Pro, The Register and other noteworthy websites, the buzz was enough to propel Music By Programmers into the download bestseller charts on Amazon, iTunes and Google Play. The limited edition CD went on sale around lunchtime on Monday, and sold out on Tuesday. The week ended with interviews for other web news sites, as well as BBC local radio, about these computer programmers who were "storming the charts". 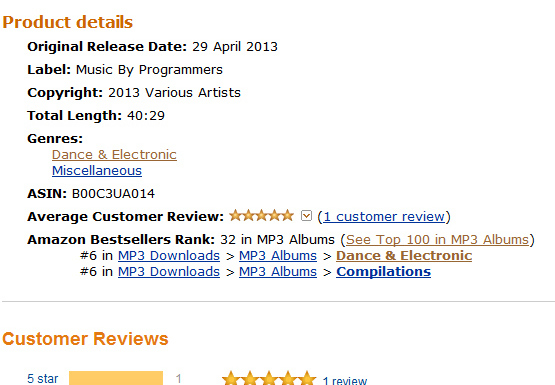 Naturally, the web having the short attention span that it does, we've tailed off quite spectacularly since Friday - though as of writing we're still in Amazon's Top 40 Dance & Electronica albums. As the saying goes, we've had our 15 megabytes of fame. Now the real work starts! A huge "thank you" if you bought the album and spread the word. With no marketing budget and no label behind us, we're relying completely on word-of-mouth. Without your support, none of this would be possible. How this all translate into sales, and therefore money raised, we shall have to wait and see. It can take months to get sales figures - and money - from the online retailers. My feeling is that we're well on our way to achieving our target, though. But I doubt we're there yet, so we still need your support to make our goals happen. If you've not bought your copy yet, please consider downloading it today. Roughly £4-5 from every sale goes directly to these educational projects, so every download counts. Just a quick post for those of you who want to support maths and programming education, or who just like electronica. 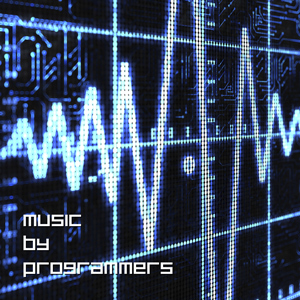 The official release date for the Music By Programmers album is Monday April 29th. It'll be available for download from all the usual outlets (iTunes, Amazon etc), and every penny of the proceeds will go directly towards parent-child maths workshops at Bletchley Park and programming workshops at The National Museum Of Computing. These are very worthwhile programmes, and your support is vital to helping more children get to grips with maths and computing.